August 24th, 2018 Orlando, FL – FlightScope, a world leader in sports 3D tracking technology, is now providing its top-of-the-line stadium radar equipment to the World Baseball Softball Confederation. The 2018 WBSC Women’s Baseball World Cup is currently taking place at the USSSA Space Coast Complex in Viera, FL. 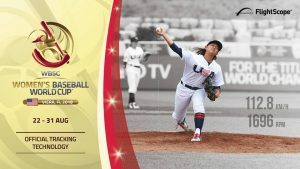 Twelve teams will compete in a total of 50 games in the first WBWC hosted in the U.S.
FlightScope has been chosen as the official tracking technology of the tournament and will be measuring pitching and hitting data like exit velocities, pitching velocities, and carry distances for each of the games. Leaders after day two of the tournament include Janiliz Rivera in Exit Velocity (92.5 MPH / 148.8 KM/H), Brittany Hepburn in Pitch Velocity (76.4 MPH / 122.9 KM/H), and Chelsea Forkin in Carry Distance (316’, 96.3M). The championship game is set for Friday, August 31.